Order Cutlery Trays from six standard configurations, depending on your drawer width, or from your own custom design. Each is crafted to fit properly in our dovetailed drawer boxes and are available finished or unfinished and in a wood species to match your drawer box order. See available wood species. 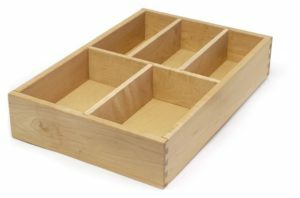 Double Cutlery Trays are available for boxes as small as 4” high, fitting in a typical top drawer configuration. 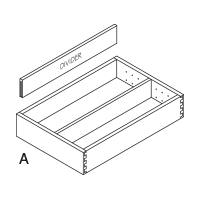 The 4” box uses two 1 1/2” high trays. 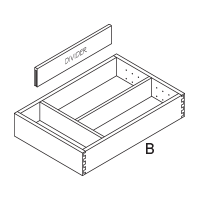 Other Double Cutlery Tray boxes incorporate two 2 1/4” high trays in a 5 1/2” or 6” high box. All Double Cutlery Tray assemblies use full-extension slides. Variation: order the bottom layer with a knife block insert. 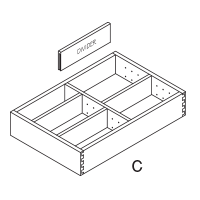 Drawers may be ordered with fixed (permanent) or removable (non-adjustable) dividers similar to cutlery tray inserts. Order them in any custom configuration.